TACLOBAN CITY- More than P44 millions of palay were destroyed due to the onslaught of tropical depression ‘Samuel’ that hit the region last week. 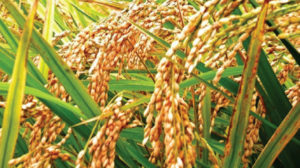 Based on the consolidated report of the regional office of the Department of Agriculture (DA), based this city, out of its six provinces, three of them reported palay damages due to Samuel. These are the provinces of Biliran, Eastern Samar, and Northern Samar with damage to their palay production placed at P44.17 million affecting 4,059 farmers with 7,263.15 hectares submerged due to flooding spawned by Samuel. Of the three provinces, Northern Samar reported the huge damage with P31.81 million involving 1,673 farmers. About 4,383.77 hectares of palay field went underwater in the province due to Samuel. The towns of Catubig, Laoang, and Las Navas were the municipalities in Northern Samar that sustained damaged to their palay outputs. Biliran reported that P4.02 million worth of its palay planted on 275.63 hectares were submerged due to the flooding. About 285 farmers from the provincial capital Naval were affected. Eastern Samar, meanwhile, reported of P8.33 million worth of damage to its palay displacing 2,101 farmers and involving 2,603.75 hectares. Nine of its towns, namely, Arteche, Can-avid, Dolores, Maslog, Oras, San Julian, San Policarpo, Sulat, and Jipapad sustained damages to their agriculture. On Nov.26, Agriculture Sec. Manny Piñol personally visited the town of Jipapad which was rendered isolated after it was hit by a landslide incident at its access road going to the rest of the province of Eastern Samar. During his visit, Piñol provided assistance to its 1,746 farmers by giving P5,000 cash; 641 bags of rice seeds and 1,285 bags of fertilizers; two units of irrigation pumps and two units of farm tractors.